Therapists Network "Show & Tell"
Be thinking about what promotional materials you might bring. And what talent might you share with the rest of us? 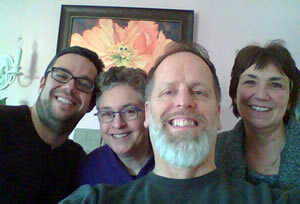 We are considering creating some photo galleries on our website of past LGBT Therapists events. Do you have some pictures you would like to share? Please contact us for directions on how to get them to us. We are pleased to report that we received over 50 responses to our Beyond The Boxes II survey. A big thank you to everyone who filled it out and for your valuable feedback. "We are seeking 2 full time Senior Licensed Mental Health Therapists who are passionate about the mission and values of RECLAIM. We are building a community of emerging and experienced practitioners who apply post-modern principles to their practice. We engage clients in holistic healing that addresses as many areas of need as possible. We specialize in supporting youth around sexual orientation and gender identity while recognizing all aspects of identity reclamation. RECLAIM is committed to recruiting candidates with lived experience in communities of color and/or transgender communities. One full time position will be offered to a candidate qualified to oversee the activities of the POC Cohort and the second position will be offered to a candidate with the qualifications to oversee either the Training or Integrative Care area of expertise (see descriptions below). We are seeking mature professionals who have extensive clinical experience and a demonstrated history of successful supervision and support of interns, fellows and/or supervisees. These therapists will have responsibility for overseeing some aspects of clinic functioning. In addition, the ability to do a variety of community trainings based on the knowledge of the client population is also necessary." Have You or Someone You Know Been Impacted by “Ex-Gay” Therapy? If you, or someone you know, has been impacted by the harmful effects of conversion therapy (also known as “ex-gay” or reparative therapy), Can’t Convert Love MN wants to hear from you. Contact Gabe at gabe@cclmn.org. • prohibit medical assistance funding for conversion therapy. check out their website to see how you can make a difference. "I work at a charter school in Willmar, MN, and supervise our Gay-Straight Alliance. Our school is project-based, meaning that students are encouraged to get involved in the community and seek answers from community experts. I've had students inquire about LGBTQIA+ issues and would love to connect them with community members/experts to further their learning. Unfortunately, Willmar has zero LGBTQIA+ resources, including medical practitioners or psychological support. I would hugely appreciate any advice or connections for my students." More than ever, teams and organizations need to increase their effectiveness and cultural competency in order to face today's challenges, meet their missions, achieve their goals, and serve diverse customers and communities. • Be a champion in your organization to support organizational cultural change towards increased equality, diversity and inclusion. • $1,000 fee covers registration and all materials for Facilitating Cultural Change. RHI's 2015 gala event - Our guests will dance to the music of the Freedom Jazz Big Band throughout the event - taking a short break to experience the dance competition and vote for their favorite dancer! Modeled after "Dancing with the Stars", local celebrities will compete for your vote and for the title of Dance!Dance! 2015 Champion. Food, cash bar and great prizes. Bismarck, ND (3/27/15), Mankato, MN (4/10/15), & Brainerd, MN (10/9/15). Camp True Colors - Minnesota is for LGBT (lesbian, gay, bisexual, transgender) youth ages 13-18 who may or may not be participating in an out-of-home program. This camp focuses on building a positive community and provides a safe and stigma-free place for its participants. Activities available include canoeing, fishing, arts and crafts, scavenger hunts and talent shows. Education sessions on topics relevant to the LGBT community are also provided. One Heartland partners with the True Colors Fund to offer Camp True Colors programs in New York, Texas and Minnesota. The Journal of LGBT Issues in Counseling invites submissions for a special issue on The Nexus of Affectional Orientation and Gender Planned publication date for the special issue is December 2015. The focus of this special issue is on overlapping issues of gender/genderism/sexism and affectional orientation/heterosexism. As both sexism and heterosexism can manifest on individual, familial, institutional, and sociocultural levels, they affect the well-being and potentialities of those we serve as mental health professionals. Manuscripts should address issues relating to the overlap in gender and affectional orientation, with priority given to related research as well as ways in which counseling professionals can work at individual, systemic, and societal levels to address these issues. Manuscripts should be grounded in theory and research. With over 100 active members, the MN LGBT Therapists' network provides an online directory of Queer/LGBT-identified and supporting mental health providers and allied professionals. We'd love to have you join us! You are receiving this eNewsletter because you have either joined the MN LGBT Therapists network, signed up for more information at a conference or event, or you have expressed an interest in our network. You may unsubscribe at any time by clicking the "Unsubscribe" link at the bottom left of this newsletter.